If you're the family member who is the most fun, then these are the Personalized T-Shirts for you. 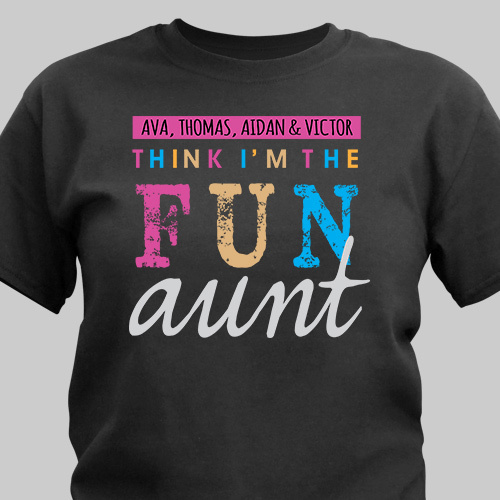 Your favorite aunt, Grandma, or your Mom would love getting this shirt that shows how much you appreciate their vivacious and goofy personality. They'll cherish this t-shirt for years to come. This Personalized Shirt is available on our 100% Cotton Preshrunk Black T-Shirt, machine washable in adult sizes S-3XL. Free personalization of any title and up to 6 names is included. Additional Details Your Mom, Grandma, or favorite Aunt would love receiving this personalized gift for occasions ranging from birthdays to Christmas. Show her how much you cherish her fun-loving personality. Our Personalized Established T-Shirt is another great gift option for her.